Governor tells Centre Tamil Nadu political situation is 'fluid'. What options does he have? 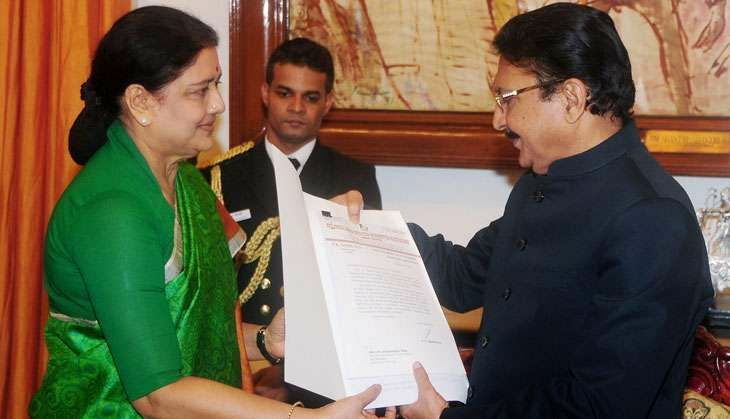 Governor C Vidyasagar Rao has informed the Union home ministry that the political situation in Tamil Nadu is "fluid" and he needs to decide whether to call AIADMK general secretary VK Sasikala to form the government as the MLAs supporting her are being held incommunicado in a beach resort. Of the 135 ruling party MLAs, 130 have been put up in the Golden Bay Beach Resort at Kovathur village off Mahabalipuram. Private security personnel from Mannargudi, where Sasikala is originally from, are posted outside the resort and they are keeping a watch on the movements of even local villagers. The bus ferrying the MLAs had stopped at the residence of the minister Edapadi Palanisamy, a Sasikala supporter. There, one MLA, Vaikundam Shanmughanathan, sneaked out and joined the O Panneerselvam camp, giving credence to the ousted chief minister's charge that the MLAs are being held against their wishes and were forced to sign letters of support to Sasikala submitted to the governor. In this situation, there is no way the governor can ascertain their wishes of the MLAs unless he directs the police to go and talk to them. He has, in fact, already met the state police chief, TK Rajendran, to discuss the law and order situation. Rao also held discussion with the chief secretary and other officials after the advocate general misled the Madras High Court, during hearing on a habeas corpus petition for the production of the MLAs, that they were staying in the MLA Hostel even though they had been taken to the beach resort. The incident showed that senior officials don't report to the caretaker chief minister but to Sasikala even though she is only the CM-in-waiting. Rao is likely take note of this situation. When Shanmughanathan had gone to lodge a complaint with him, Chennai Police Commissioner S George refused to meet him. Shanmuganathan told reporters he was directed to a junior police officer with whom he filed a petition asking that the legislators be brought back from the resort to the MLA Hostel in the city. In response to a couple of habeas corpus petitions, the Madras High Court directed the Kancheepuram superintendent of police to visit the resort and report the situation. Following this, ministers such as KA Sengottayan, who were keeping a watch over the MLAs, scurried for cover. To show that they were free to go, one of the MLAs came out and told reporters camping there that he had taken time off to visit a temple in Puducherry and would return in the evening. A little later, 10 MLAs escorted by security guards told TV reporters in a brief chat that they were staying in the resort of their own free will. Denying that their mobile phones had been taken away or forcibly turned off, one of them showed his cell. However fluid the situation, the governor is left with limited options after he hastily accepted the resignation of Panneerselvam and made him a caretaker chief minister. The governor can neither reinstate Panneerselvam nor ask him to take a floor test since that would falls foul of the Constitution. Moreover, Panneerselvam's revolt is yet to gather momentum as only the AIADMK's "deadwood" such as presidium chairman V Madhoosudhanan, former MPs Maitrayan and PH Pandian, and former state minister Natham Viswanathan, who had fallen out of favour with the late J Jayalalithaa, are with Panneerselvam. More important, only five MLAs have gone with the caretaker CM, so the odds are stacked against him. Questioning his expulsion from the AIADMK, Madhusoodhanan has petitioned the Election Commission that Sasikala's election as the party general secretary was in violation of the party's bylaws as she had not completed five years as a member. Senior Congress leader Mani Shankar Iyer has said that with the Supreme Court judgment in the disproportionate assets against Sasikala expected in a few days, the governor is well within his powers to wait. BJP spokesperson Seshadri Chari has said in the evolving situation, the governor has the discretion to wait and see who commands the support of the MLAs. He added, tongue-in-cheek, that "at the moment, only the manager of the resort has the maximum number of MLAs". Contrary to the governor's expectation, the SC judgment is now expected to be delivered only by next Monday, if at all. If the verdict goes against Sasikala, she will stand disqualified from running for public office for six years. In such an eventuality, the tide will surely turn in Panneerselvam's favour. But if the verdict goes in her favour, the governor will have to call Sasikala to form the government, regardless of whether she is popular or not and whether the MLAs will shift their stand when the assembly convenes for the floor test. Even if Sasikala fails the floor test, the chances of which are remote now, the governor cannot recommend President's Rule. It can only be the last option when no alternative government is possible. But an alternative is possible in Tamil Nadu. The DMK, which has 90 members in the 234-member assembly, has already offered support to Panneerselvam. The party's working president MK Stalin has argued that foisting Sasikala as the chief minister on an unwilling people would be undemocratic, so he will back Panneerselvam. Meanwhile, because of the political turmoil, the state administration has come to a standstill; the State Secretariat wears a deserted look as all the ministers are busy elsewhere. TWEET THIS At the moment, only the manager of the resort has the maximum number of MLAs: Seshadri Chari, BJP Governor tells Centre Tamil Nadu political situation is 'fluid'. What options does he have? READ NEXT >> UP Polls: Congress' Pradeep Mathur seeks a fourth term. Will Mathura allow him?